Our multi-purpose compost is enhanced with the innovative ingredient, Forest Gold, combined with essential nutrients and trace elements, to create a premium product. 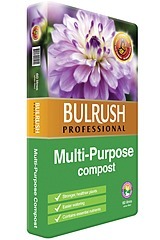 This compost formulation delivers superior plant growth, healthier plants and improved water holding capacity. Ideal for planting jobs all around the garden for unrivalled results.